Sparkler Filters manufactures both manual and automatic Nutsche filters. Nutsche filters are single horizontal plate filters in a vertical tank for processing concentrations above 5% of easy to filter solids. Contact Schoonover, Inc. for more information on which Nutsche filter is best for your application requirements. Manual Nutsche filters are available in a variety of designs. Cake discharge is by scoop or shovel, with a bottom drop door, lifting a basket from the tank, tilting the tank, or dissolving the cake in place. The WD is a wash and dry automatic Nutsche filter with a special impeller to assist in filtration, washing, drying and automatic cake discharge through a valve in the bottom of the filter tank. By combining multiple unit operations in a single tank, product yield is maximized and operator exposure is minimized. 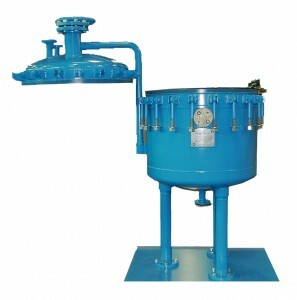 For processing large volume of easily filtered solids (crystalline) solids. Primarily for processing valuable solids. Special impeller assists in filtration, reslurrying,washing, drying and cake discharge.